Essentially, the Ravens are facing a short six game season in a race to finish atop the AFC North. Best case scenario while the Ravens enjoy their bye week, no division rival enters week 12 with seven wins. The Browns are 6-3 and host Houston. The Bengals are 5-3-1 and travel to New Orleans, and the Steelers are 6-4 and travel to Tennessee. The Steelers have the best shot at getting to seven wins given the opponent, but their bye week is week 12 where anyone can match their seven wins if they get there. In fact, the Ravens can move from last, to first in the division without even setting foot on the field, if all three AFC North foes lose this weekend. That’s how close it is. 10 wins is always the benchmark for getting into the playoffs. Most times that will be good enough, meaning the Ravens need to win four of the final six to get there. Football is the ultimate team sport. Everyone needs to do their fair share, but no one is counted on more than the quarterback. It’s his job to execute and put up the points, and to pick up the slack if the defense starts falling behind. Flacco has been great at times, and average or worse at times this season. 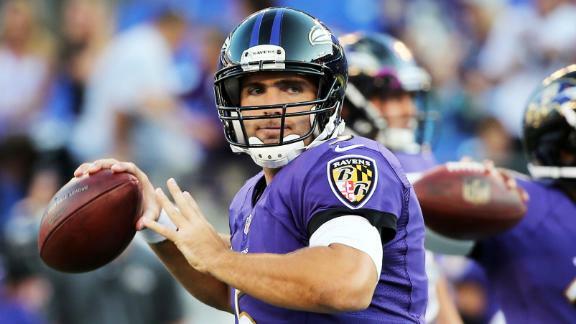 What is expected from Joe Flacco here in this six game sprint to the finish? No doubt about it, it has been a roller coaster season of sorts for Flacco. He is consistently, inconsistent. Let’s take a look at his QBR week to week. Up, down, up, down, up, down, down, up, up…..? Let’s hope it keeps going up because going down from a 51.4 QBR will lead to a poor outing in an important game. Check that out. Joe Flacco’s worst game of the year was book ended by two games that would make Peyton Manning blush. Let’s take a look at some of the trends to see what we can expect from Joe down the stretch. So lets take look at the schedule again. @ New Orleans. A losing team on the road. The Saints are 19th in pass defense. Flacco is 2-2 against teams better than that (TEN #10, CLE #11 – CIN #17 twice). Kind of a coin flip here. vs. San Diego. A winning team at home. The Chargers are 7th in pass defense. This would be the best secondary Joe Flacco has faced this year. Flacco plays better at home, but this secondary will be a tough test. Before the Texans season went in the crapper last year, the Kubiak led squad opened the season with a 31-28 win on the road at SD. @ Miami. A winning team on the road. The Dolphins are 9th in pass defense. This one doesn’t look like a favorable matchup in any case for Flacco. However, Kubiak beat Miami in 2011 and 2012, and Flacco went into Miami and took care of business last year. vs. Jacksonville. A losing team at home. The Jaguars are dead last in pass defense. Flacco should have a QBR over 90 in this game, with ease. @ Houston. A losing team on the road. The Texans are ranked 26th in pass defense. Other teams of note with poor pass defenses are Tampa Bay (28th), Atlanta (30th), and Carolina (31st). In those three games, Flacco’s average QBR is 93.5. Despite the road game, a favorable matchup here. Then again, who knows the Kubiak offense and how to beat it better than Houston? On the flip side, who knows the Texans defense better than Kubiak? vs. Cleveland. A winning team at home. The Browns are 11th in pass defense. The Ravens beat them on the road in week three. If a playoff berth is on the line, I like the home team and the home crowd, and the veteran leadership on the Ravens to excel over the Cinderella story going on in Cleveland right now. Jacksonville and Cleveland are wins. Get that out of the way now. Looking ahead to the next game, a close game, I have to give the edge to New Orleans as the teams are evenly matched, and the Superdome is a great home field advantage. San Diego was embarrassed by Miami, 37-0 earlier this year, in part because west coast teams tend to struggle when coming to the east coast. The Ravens home field advantage is no slouch either. I’ll give the Ravens the edge there. In the roller coaster type fashion that Flacco’s success emulates, I think he’s due for a stinker when going to Miami. He’ll probably play ok in New Orleans, pretty well against San Diego, and then a drop off in Miami. After this Miami game though, Joe Flacco and the Ravens should finish with three straight wins, finishing with 10. It’ll feel like the sky is falling if they go 1-2 over the next three, falling to 7-6. But the schedule makers were generous with the Ravens final three games. Furthermore, here is a look at the division’s final three games. If the Ravens find themselves in a position where they control their own destiny, they have a better shot than any other division foe at running the table for the final three games.